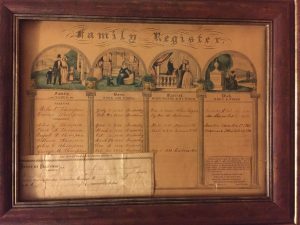 Over the holidays, my mother gave me the very nice present of a family register that began with my great-great-great-grandparents – Robert and Emma (Russell) Thompson of Industry, Maine. 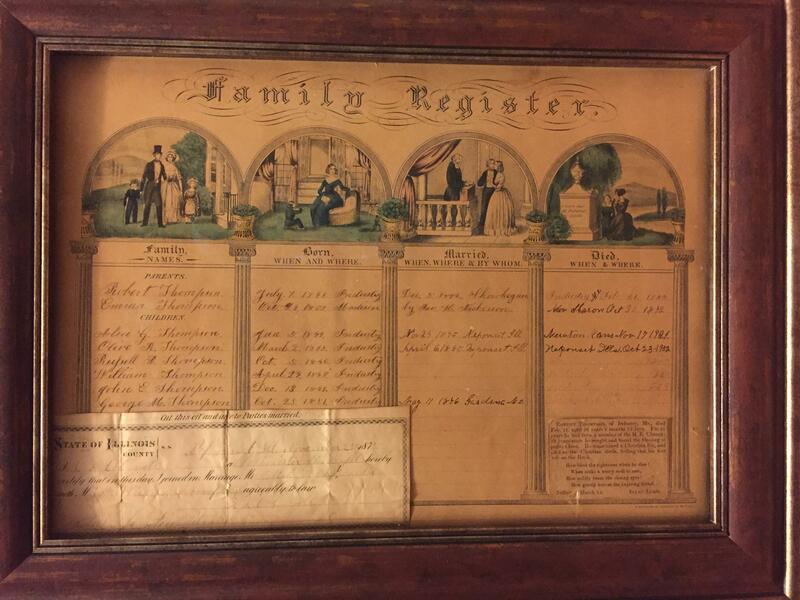 This framed register used to hang on a wall at my grandparents’ home in Kansas, and I had taken notes from it when I got interested in family history. My mother got it after her mother’s death in 2008, and she decided I was the best relative to receive it. This register was produced by D. Needham, 12 Exchange St, Buffalo, and years ago I recognized a copy of the same style register for sale in our own bookstore. The register is written in different hands over varying time periods. 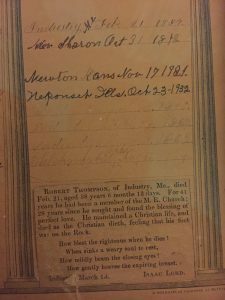 Robert Thompson had two earlier marriages that are not represented on this register. His eldest daughter by his third and last wife Emma Russell was my great-great-grandmother Alice Goodrich Russell Thompson, who was named for her father’s first wife Alice Goodrich and her own mother. Several of the dates appear to be largely written at the same time, these being Robert and Emma’s births (1795 and 1808), their marriage (1842), the births of their six children (between 1844 and 1851), and Robert’s death (1854). However other dates (from 1872 to 1932), are from different inks and sometimes a different handwriting. Some insight into family communications can also be derived from analyzing when different dates were written. Alice and her sister Olive Thompson both left their hometown in Maine in the early 1870s, moving as single women in their late twenties to Neponset, Illinois, where they were employed as school teachers and where, a few years later, they met their future husbands. Alice married Josiah Challender, a recently widowed veteran of the Civil War, in 1875, and Olive married Christopher Studley (also a widower) in 1880. 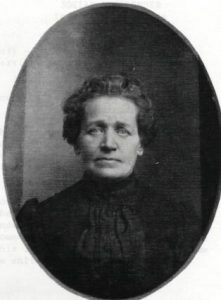 Olive and her husband stayed in Neponset, while Alice and Josiah, after having their four children in Illinois, moved to Harvey County, Kansas in 1892 where many generations of their descendants have lived. 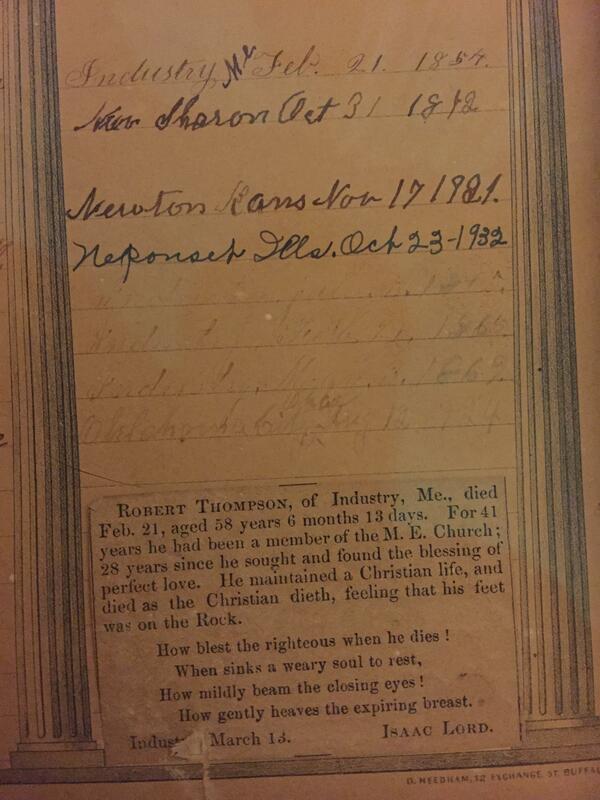 Part of the framing of this register includes the original 1875 Illinois marriage license return for Alice and Josiah, as well as an 1854 Maine newspaper clipping of Robert Thompson’s death. As the handwriting and pen of all of the events up to Robert’s death in 1854 are clearly the same, my educated guess is that Emma (Russell) Thompson wrote all of these events onto the register. All later dates are written by other people. It’s possible Alice was given this family register by her mother before she left New England for Illinois. The marriage dates of 1875 and 1880 for Alice and Olive appear to be in the same handwriting and ink, which lead me to believe they were written by Alice when living in Neponset. The marriage date of the youngest sibling – George, who was married in Maine in 1876 – also appears in the same penmanship, but in a slightly different ink. This suggests some level of communication between Alice and her family back east. The 1872 death date of Alice’s mother is also written in, but may also be another handwriting, as are the deaths of Alice in 1921 and Olive in 1932. Alice’s four younger brothers were all written in pencil, which has faded over the years due to light exposure. But the third through fifth brothers all died in Maine between 1865 and 1869 (all unmarried), while the youngest brother died in Oklahoma City in 1924. Fortunately, I can verify all the faded dates from other sources. As these dates between 1865 and 1924 were all penciled in the same penmanship, I would think they were written in sometime after the last death in 1924, by someone intent on “completing” the register – but not, perhaps, confident enough to use a pen! Fortunately, I can verify all the faded dates from other sources. As Alice would have certainly known of her younger brothers’ deaths in the 1860s, for whatever reason she never filled those in. How Alice communicated with her family back east is unknown to me, but this beloved family treasure, one that hung in her grandson’s farmhouse for decades and now rests with me (traveling from New England to the Midwest and back again), provides a tiny clue. You should do everything possible to preserve that, rather than just hang it on a wall. Also make a digital copy! I like the “forensic genealogy” done here!!!! Oh Chis, what a treasure! Do you possibly have an Amy Thompson, daughter of Miles Thompson, in your family tree? I have unconfirmed birth and death dates. Amy born in Kittery, Maine, about 1650, and Miles born in Kittery about 1627. Before Miles, I have a brick wall. Hi Pat – Robert’s grandfather Hugh Thompson immigrated in the mid to late 18th century to New England from Ireland (see A History of the town of Industry, Franklin County, Maine, 1893, by William Collins Hatch, pages 820-825 – https://archive.org/stream/historyoftownofi00hatc#page/820/mode/2up), so sorry I’m not any help on early Kittery Thompsons. Good luck. Among the family treasures distributed at my mother’s death was a sampler done by her great-grandmother, Elizabeth Burrell Turnbull, b. April 1825, her parents and her 5 siblings. Our great-aunt, Grace Burrell McCartney, later added all the dates of the deaths of each in stitching so closely matching the original that you cannot tell who did what BUT probably damaging its value as an artifact. Elizabeth Turnbull went to live with her widowed daughter (my great-grandmother) and together they helped clothe some 30+ sons of the wealthy families in Rochester. As they stitched,they talked family and little Grace listened. She later graduated from the University of Rochester in 1909, in the first class to allow women, was a Phi Beta Kappa, and as the holder of an MS in library science from Columbia and a spinster, was our family genealogist. Our information on the Burrell-McCartney-Turnbulls-Guthries of the Borders and of N. Ireland all comes from her careful recording of both her research and personal conversations. She wrote about each family during her years in a nursing facility and MOST of her information can be documented.